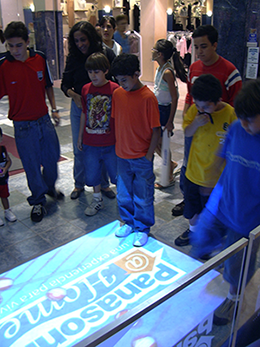 GroundFX® Interactive Floor/Wall projection is a fun, engaging way for visitors at attractions worldwide to play and compete without using anything but a gesture with their feet and hands. Interactive movie trailer, band posters, concert listings at pavilions, concert halls and sports arenas. There is no limit to the use of GroundFX for entertainment venues. Play with balls or pucks advertising your favorite team before seeing the game. It’s a win-win when GroundFX Interactive Floor/Wall Projection is your first choice of entertainment media marketing solution.